When Amanda’s mother brings home an antique mirror, Amanda persuades her to put it in the attic of their new home-a rambling Victorian with many passageways and closets. Amanda, an aspiring fashion designer, keeps old clothing up there to mix and match, experimenting with different ensembles. After many nights of hearing noises and sleeping poorly, she convinces her mother that she should allow Amanda to have a sleep-over. She hopes not having to sleep in her room alone, and with two friends to distract her, she can forget about the creepy noises she keeps hearing. That night, the girls are impressed by the charm of the beautiful mirror. And then the trouble begins. Raymond Bial has spun an exciting time travel story that keeps the reader wanting more. But it’s not just a mystery. Description of the historic details of the haunted house in the first chapter is reflective of the Victorian period to which Amanda and her friends will be thrown into in the following chapter. It is in 1912 that they learn all was not charming about this period in history. Immigrants were looked down upon. People were fighting for better working conditions, and prejudice was rampant. But once the girls are thrown back in time by the mysterious mirror, they must figure out why they have been brought to the exact same house in 1912. 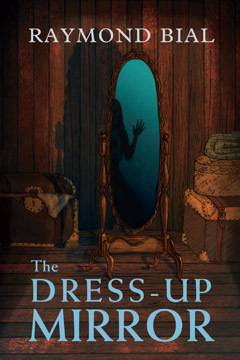 The Dress-Up Mirror is a fast, fun read. Finally, even though the girls learn some ugly truths about our rapidly growing country at the turn of the last century, they also learn that most people are kind and want to help others.